Home Off Beat	J-Body Cavalier Craze was Shown on the Arm! J-Body Cavalier Craze was Shown on the Arm! J-Body Cavalier is tattooed on a twenty-four year old guy. 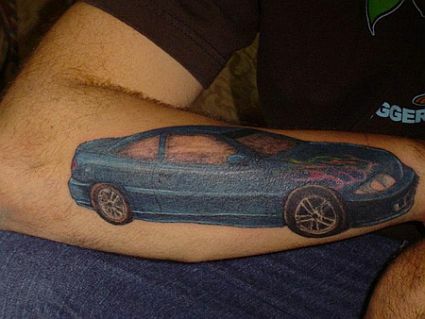 This guy loves his slightly molded Cavalier and his love for it was expressed to everyone when he got this tattoo on his arm. When he was asked why he chose to tattoo on his arm than any other part of the body, he simply replied, “I wanted it on my forearm so if anyone pisses me off, I can hit them with my car and not get vehiclular assault.” Cavalier is inked with vivid Technicolor on his arm.